Relaxation herbs such as jasmine are well known and well appreciated all around the world. Because 8,000 flowers must be hand-picked to make one gram (or 0.035 ounces) of this essential oil, jasmine oil is considered to be quite precious. Jasmine can improve your health and decrease your stress levels if you combine it with a relaxation technique such as aromatherapy. If you are wondering, “How does aromatherapy work?”, find out here. 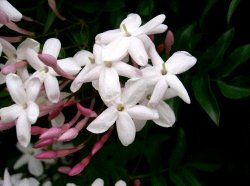 Jasmine has an initially strong, sweet, warm, exotic and richly floral smell. Its note is medium. How Can You Use Jasmine Flowers and Essential Oil? as shown below. These pearls open up when hot water is added and the aroma and flavor of these relaxation herbs are delicate and well appreciated. Jasmine essential oil used to be called a “love potion”. Its aphrodisiac properties are well-known and it can also improve your mood and sense of well-being. If your mind tends to race, jasmine can help you relax. Its aroma can also help improve self-confidence and make a room seem more inviting and more comfortable. This essential oil is great for people dealing with, apathy or depression. Jasmine combines very well with ylang ylang, neroli, clary sage and sandalwood. You can add 20 drops of jasmine essential oil to a warm bath if you are looking for an easy relaxation technique. If you like bath bombs, I recommend LUSH’s All That Jasmine Bath Bomb. You can give a relaxation massage by mixing 15 drops of jasmine essential oil to 15 ml (1 tablespoon) of jojoba oil. Another aromatherapy option would be to use a vaporizer and mix 20 drops into 30 ml (2 tablespoons) of water. Note: Jasmine essential oil may not be suitable during pregnancy because of its emmenagogue properties. This oil is normally diluted in a carrier oil before being applied to the skin. This carrier oil is normally Jojoba oil. An estimate of 5-30 drops of essential oil per 1 oz of carrier oil is suggested. Make sure to read the important safety note below. This essential oil normally comes in various sized bottles and can be found in major drugstores and specialized stores. I recommend this online retailer who sells jasmine essential oil. You can also find this oil or relaxation herbs from your local aromatherapy retail store. This essential oil also comes in 1/8, 1/4, 1/3, 1/2 or 1 oz bottles and can be found in major drugstores and specialized stores. IMPORTANT SAFETY NOTE: Pregnant women, or people with health problems should not take this essential oil or relaxation herbs before consulting a specialist. Undiluted oils should never be applied onto the skin. Do not take any oils or other relaxation herbs internally without consultation from a qualified professional aromatherapy or health practitioner. Consult a professional aromatherapy practitioner prior to using this oil or relaxation herbs to treat children.